Publishing a blog post is not your only opportunity to share it on social media. 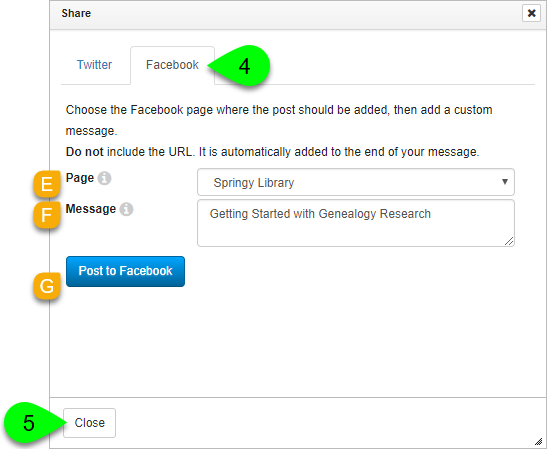 In fact, you can share posts you've already published as many times as you'd like. This can be helpful if you want to spread the word about upcoming events or other important info. Select Share from the dropdown. The Share window will appear. 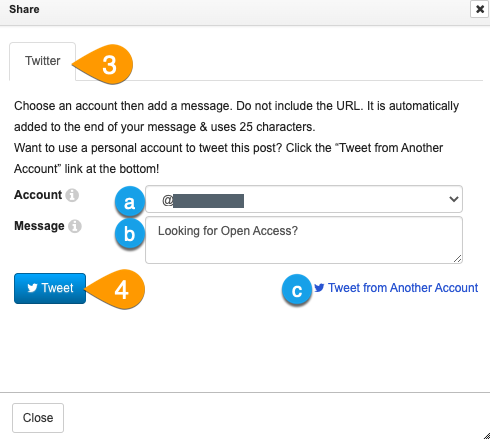 Under the Twitter tab, you can customize and share a tweet to a connected Twitter account. Use the Account dropdown to select from the Twitter accounts connected to your LibApps Social Channels. Use the Message dropdown to customize the text of your tweet. Click the Tweet button to share your tweet. If you would like to tweet from a Twitter account that is not listed, click on Tweet from Another Account. This will take you to Twitter, where you can sign into the account you want to share from. Click on the Facebook tab to share your post on a connected Facebook account. Use the Page dropdown to select from the Facebook pages connected to your LibApps Social Channels. Click the Post to Facebook button to share your post. When finished, click the Close button.